Located in scenic Kelvin Heights, the Queenstown Golf Club has been voted as the most picturesque golf course in all of New Zealand and is recognised as one of the world’s most stunning golfing locations! With views of the spectacular Remarkables Mountain Range and surrounding Lake Wakatipu, we should probably warn you that your handicap might suffer as a result of distraction caused by the extreme beauty surrounding your game. Queenstown’s undulating fairways are dotted with attractive groves of pine trees, which add an exciting edge to the challenge. The Queenstown Golf Courses fifth hole is actually renowned amongst golfers as it is one of New Zealand’s most photographed locations, offering direct views of the sparkling Lake Wakatipu. The eighteen hole Arrowtown Golf Club is located in one of New Zealand’s most attractive historic locations – Central Otago. Each fairway offers stunning alpine views and each hole has its own unique scenic perspective of remnants of historic stone cottages, impressive stands of trees, mountain scenery and much more. The scenery is one thing, but the diverse challenges that the course offers its golfers are prominent in attracting the attention of an international golfing audience. Arrowtown’s historic past has had much influence on the development of the course, with holes named in honour of the town’s goldmining past. Locations such as Sons of Fortune and Golden Arrow have lent their names to these holes. The course itself has some history, being first opened in 1937 as a nine hole course, with an expansion to eighteen holes occurring in 1970. This spectacular course is 5,327 metres on the men’s cards, at par 70 for men and par 71 for women. Millbrook Resort is an eighteen hole course that was originally designed by Sir Bob Charles, with numerous upgrades occurring over the years. This course is well suited to all skill levels, with five tee positions available, but the attractive surroundings, views of the Remarkables and perfectly manicured greens and fairways are what draws the crowds to this beautiful course. Regardless of your handicap, Millbrook Resort will set you a challenge that is highly fulfilling. As one of the most praised international golf arenas in the world, visitors to this course will be met with exciting water courses and complex hazards that make each new game an alluring one. As one of the world’s most picturesque golf courses, Jack’s Point par 72 championship golf course is fast gaining a reputation as a perfect location for golfers of all skill levels. With the majestic towering Remarkables Mountain Range setting the scene with its views of mountains and lakes, this eighteen hole course offers a serene oasis for the perfect round of golf. Jack’s Point is a uniquely designed golf course as it used the absolute minimum amount of excavation required to build. This is because the designer wanted to minimise environmental impact and work with the existing landscape to create this 6,388-metre (7,088 yard) masterpiece. This design tactic worked brilliantly and Jack’s Point is now known as one of the world’s most amazingly terrained golf courses. Throughout your round, you’ll navigate rocky outcrops, steep drop-offs, crops of bushland and tufts of grassland before surfacing on the sand shoreline of the unspoiled Lake Wakatipu. This spectacular eighteen hole, Par 72 golf course allows for four tee Positions, making this a great all-rounder course. With over 500 acres of landscape across a broad glacial valley, this scenic marvel has been designed with an eye for beauty, as well as a great golfing challenge. With over ten Mill race fed lakes (as well as a number of ponds and waterways throughout the course), a variety of flora and artistic sculptures throughout, The Hills could be mistaken for a premier wedding venue. These aesthetic components are more than just a visual feast though – combined with the native and exotic trees, tussocks of grass, wetland areas and reeds, the challenges presented by the landscaping are highly satisfying along this this wonderful championship course. 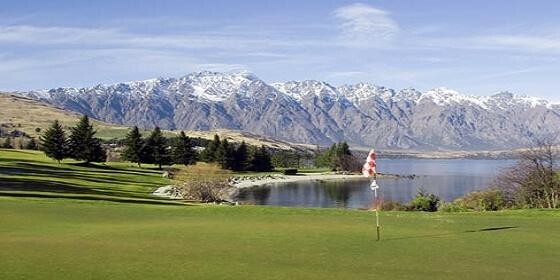 This golfing tour allows you to experience all five of Queenstown’s premier golfing destinations. With a passion for making your golfing experience a memorable one, you won’t have to worry about a thing, as everything – including transport and instructions – is included. If you’re still having trouble deciding which course to play at, the friendly tour guides at Remarkable Golf Tours can help you determine which of the five amazing Queenstown courses best suit your skill levels and desires. You can even choose to try all five courses! Whatever you choose, you can be assured of receiving the very best tailored service possible.